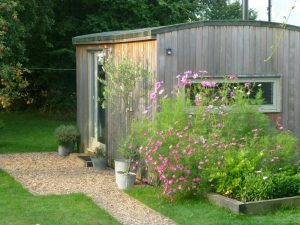 Here are my favourite pieces that I wear all the time as well as those that I’m coveting! These really are my favourite of the new pieces. 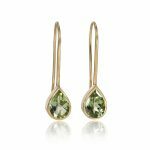 Tiny 18ct yellow gold hoop earrings made from square wire with elegant slender green Tourmaline drops. 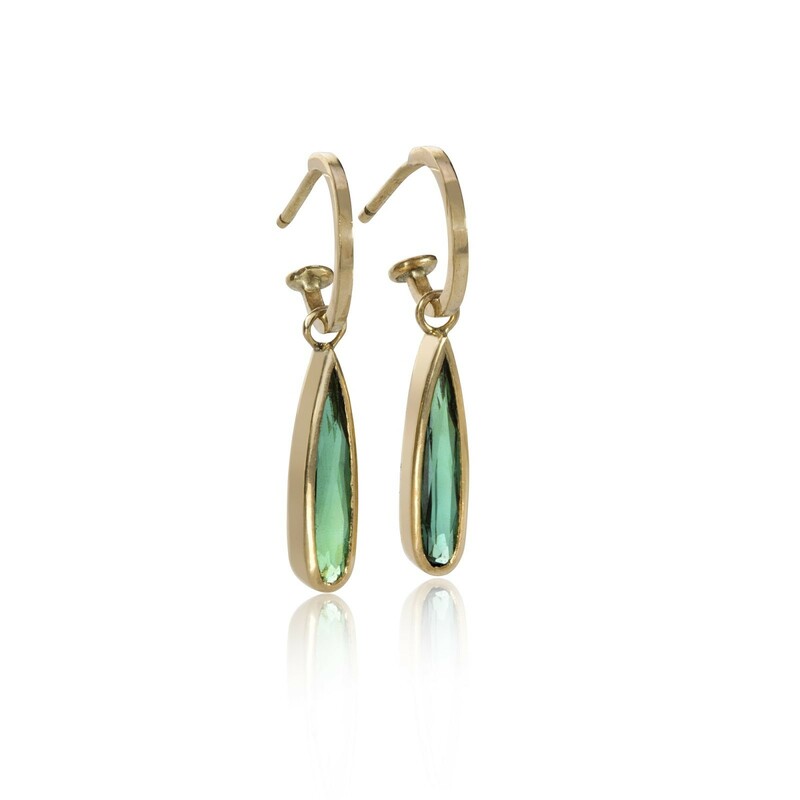 The tourmalines can be removed so the hoops can also be worn on their own. Other stone drops available on request. 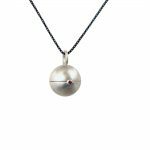 An elegant statement worn on its own or paired with the Haematite and Tourmaline drop necklace. 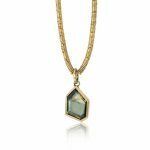 A very interesting and unusual geometric shaped Australian green/blue sapphire (approx 2 carats) set in 18ct yellow gold. The stones has some very interesting colour changes and inclusions, which give it real character. The necklace/chain part is made up of hundreds of tiny handmade 18ct jump rings running loose on a 18ct box chain. The tiny jump rings section is 15.5cm long and naturally sits at the front/bottom of the necklace (only the jump ring section is shown in the image). Necklace/chain and pendant can be purchased separately. 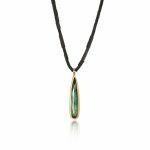 A simple but very elegant necklace made from rectangular Haematite beads and a slender green tourmaline drop set in 18ct yellow gold. The clasp (not shown) is an 18ct yellow gold ring and bar fitting. Necklace length 45cm. 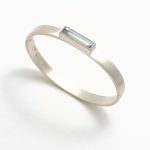 Looks great on its own or paired with the gold hoop and tourmaline earrings. These lovely rings are part of new collection of Architect rings. 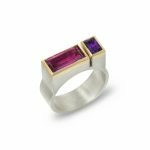 A contemporary and striking chunky silver architect ring with a beautiful pink baguette Tourmaline and a purple Amethyst. 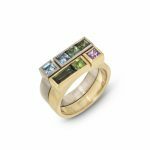 The stones are rimmed with 18ct gold. Ring size: P As shown in the second picture, An all silver chunky architect ring with a brown tourmaline and a dark blue London Topaz. 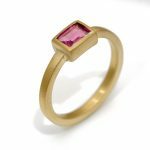 Ring size O1/2 Available to order with different stones on request. 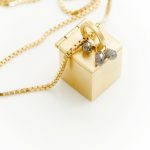 The latest addition to the box pendant collection with a hinged lid! I've been wondering what to do with these gorgeous tiny diamond drops and I think I found the answer......my favourite box so far! Sorry all option of this necklace are now out of stock, however please contact me if you would like something similar which can be made to order. 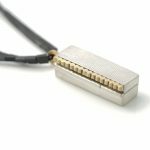 A new contemporary necklace made up of sections of movable squares, two rows layered on top of each other. It's simple and extremely elegant. 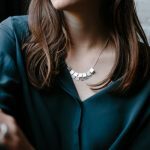 Some more pictures of this and the other new products in this range will be available very soon, but in the meantime I didn't want you to miss out on the opportunity of purchasing this necklace online!